If you are ready to dive into the MapReduce framework for processing large datasets, this practical book takes you step by step through the algorithms and tools you need to build distributed MapReduce applications with Apache Hadoop or Apache Spark. Each chapter provides a recipe for solving a massive computational problem, such as building a recommendation system. You'll learn how to implement the appropriate MapReduce solution with code that you can use in your projects. Dr. Mahmoud Parsian covers basic design patterns, optimization techniques, and data mining and machine learning solutions for problems in bioinformatics, genomics, statistics, and social network analysis. 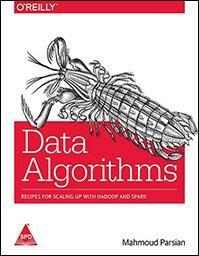 This book also includes an overview of MapReduce, Hadoop, and Spark.